Our look back to the 1984-85 season continues with a demolition of Brian Clough’s Nottingham Forest. As the season approached December, Everton were many people’s favourites to win the title, although Tottenham and Manchester United were putting significant pressure on the Blues at the top of the table, and despite enduring a difficult start to the season, Merseyside rivals Liverpool were beginning to fight their way back into the title race. By the middle of November, Everton had already played 23 games and the sheer weight of the fixture list appeared to be catching up with Howard Kendall’s Everton. The Blues had already secured the Charity Shield and were competing in 4 further competitions. The Toffee’s had made good progress in the European Cup Winners Cup and had recently progressed to the Quarter Final stage after defeating Inter Bratislava 4-0 over a two-legged tie. Everton were also enjoying a good run in the Milk Cup and had beaten Sheffield United and Manchester United when they were drawn against Division Two side Grimsby Town in the 4th Round. Everton were massive favourites, but a sense of realism struck when the Mariners defeated Everton by a single goal to nil in a disappointing Tuesday night at Goodison Park. That defeat hit the Blues hard, as they only picked up 2 points from the next 9 available as Everton let the chasing pack close within a single point at the top of the table. Next up at Goodison was Nottingham Forest. The East Midlanders had built a strong reputation under Brian Clough and only 5 years earlier had won the European Cup for the second season in succession. in 1984 Clough was in the middle of re-building his team and Everton took advantage to get their Championship push back on track, although no one could have predicted the ease in which Everton secured victory. Howard Kendall was able to name his strongest possible side, with Gray partnering Sharp in attack, a midfield of Reid, Bracewell, Steven and Sheedy operated in front of the regular back four, Stevens, Van Den Hauwe, Ratcliffe and Mountfield with Neville Southall completing the Everton line up. Everton started strongly and were 3-0 up before half time, totally over powering their opposition. The first goal came courtesy of a Kevin Sheedy free kick. The Irish international floated a brilliant ball into the box, which was met powerfully by Andy Gray. 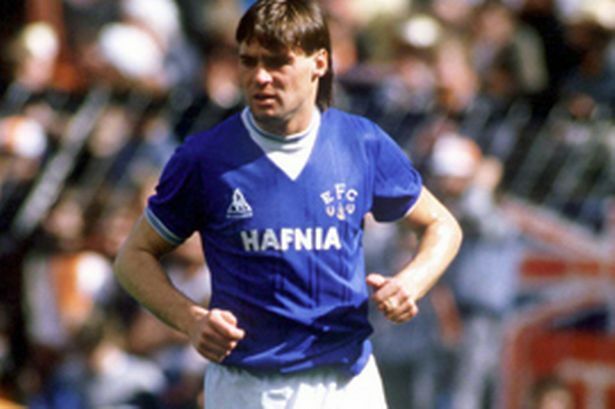 Hans Sagers in the Forest goal did well to keep Gray’s header out, but Graeme Sharp followed up to poke the ball home and put Everton into the lead. Everton, attacking the Gwladys Street end, were quickly 2-0 ahead. A brilliant flowing move involving Steven and Reid, finished with the ball squared perfectly into the path of the on running Sheedy to fire the ball home from inside the penalty area. Sheedy was again involved in Everton’s third, his corner was flicked on by Derek Mountfield and Trevor Steven had been left unmarked and pounced to flick into the goal and put the Blues out of reach before half time. After the break Everton continued to push for further goals, with the fourth goal of the match the pick of the bunch. Peter Reid picked the ball up near the half way line and powered forward, holding off the Forest midfield, played a neat one-two with Andy Gray before collecting the ball perfectly and firing past Sagers to send the Goodison crowd wild. Everton were now toying with Forest and after a scrappy spell of play the ball fell to Bracewell on the left hand side. With the Forest defence at sixes and sevens, Bracewell squared for Sharp to finish and complete the scoring, a resounding 5-0 win for the Champions elect. Although Everton lost the following week to Chelsea, they never really looked back and won the title at a canter. Enjoy the goals on this exclusive video and use the comments section to inform us of your memories of the day.